You’d never expect to learn fishing advice during a trip to the mall. Last winter I was visiting the high school science fair at Merritt Square Mall. Many of the projects were beyond my understanding, but one experiment by a young man named Mason Law piqued my interest. 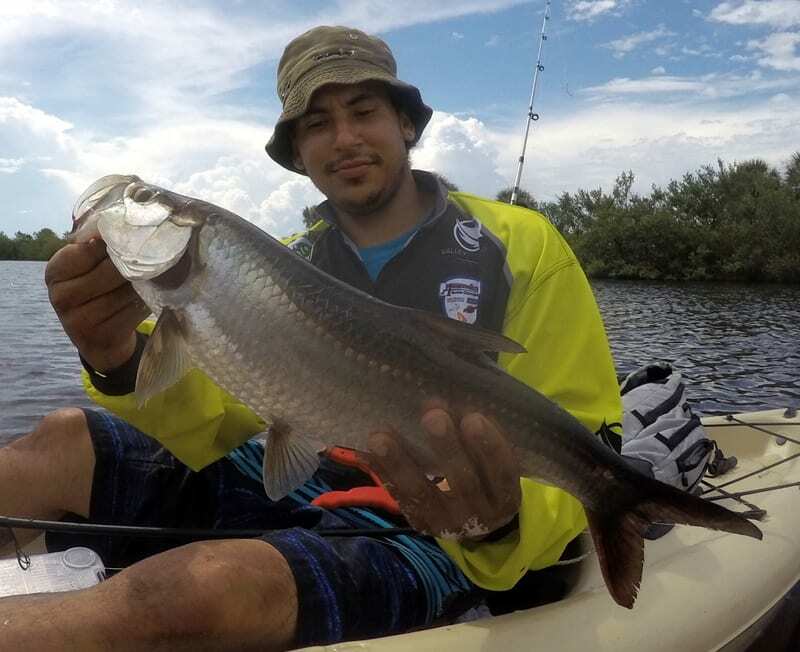 Law is an avid angler who especially enjoys pursuing juvenile tarpon. His project involved measuring dissolved oxygen levels in the water for various locations around the Indian River Lagoon. Law found areas that held juvenile tarpon had lower levels of oxygen in the water than other locations in the lagoon. This is understandable given a tarpon’s biology and habits. A tarpon’s swim bladder functions like a primitive lung and allows it to extract oxygen from the air it gulps when it rolls on the surface. Baby tarpon use this to their advantage and seek stagnant back waters where most other fish, especially their predators, wouldn’t survive. 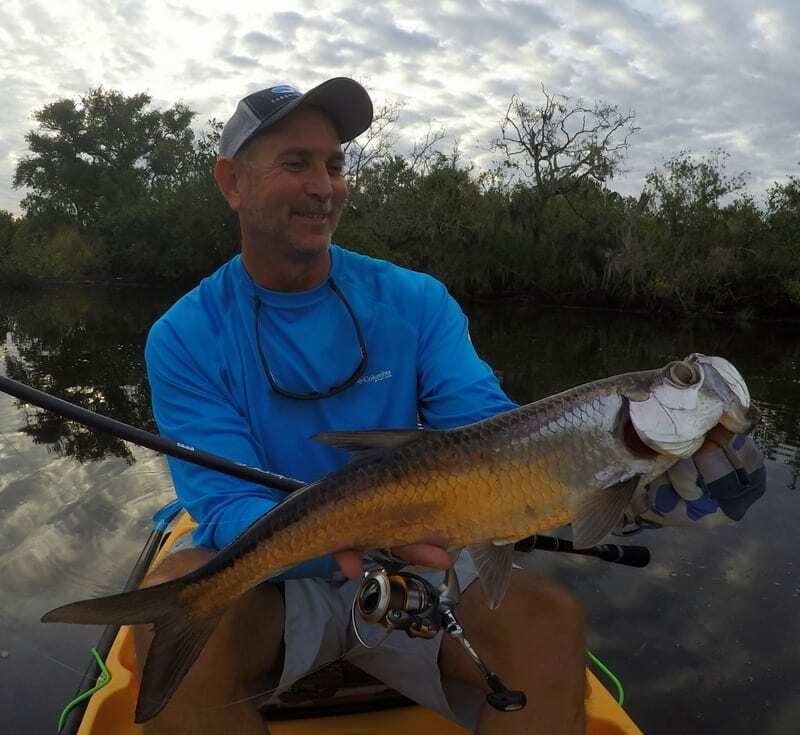 Now you might get lucky and find young tarpon on a lush grass flat with ample oxygen, but for consistent juvenile tarpon success you need to search the creeks, canals and marsh ponds. Mapping websites that provide aerial images can be a huge help in finding potential tarpon hot spots. Look for canals, creeks and ponds that connect to the to the Indian River Lagoon system, and be aware that connection can be a culvert pipe. Also keep in mind these bodies of water don’t have to be close to the lagoon as juvenile tarpon are known to roam miles inland. Once you’ve identified potential tarpon spots it’s time to get out and explore. If you are patient and there are tarpon around they should eventually reveal themselves by rolling on the surface. If you are lucky you’ll see them striking bait. Remember where you find tarpon as they tend to frequent the same locations year after year. 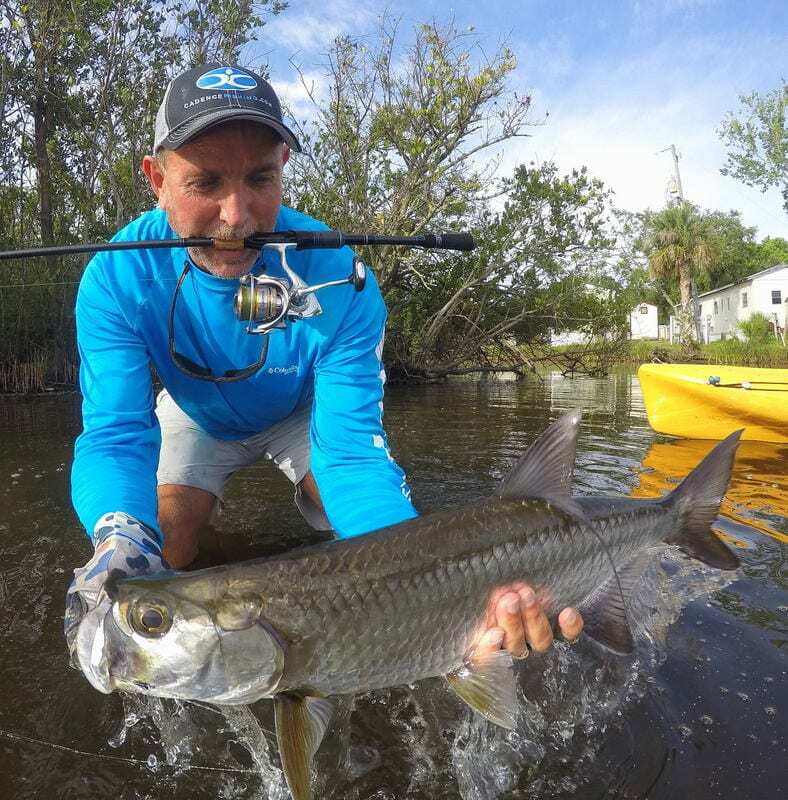 A tarpon’s propensity for stagnant waters can provide clues for what kind of lures to use. The primary forage in these locations are small baitfish like killifish and gambusia minnows. Tarpon key on these small baits so I find the magic number regarding lure size is three inches. Tarpon tend to eat lures and flies that are about three inches long or less while bigger lures are usually an exercise in frustration. I love small jerk baits for tarpon but these can be tough to find. My all-time favorite is the three inch Shad Assassin by Bass Assassin. I’ve been using these for years and have caught hundreds of tarpon on them. I’ve also learned retrieving a small swimbait just under the surface can be deadly on tarpon, and the Oblivion Baits Deadswim is great for this technique. Tarpon are notoriously difficult to hook so I like to rig these baits with an exposed hook. I like a straight J hook with a nice bait holder barb on the shank. My personal choice is a 2/0 Trokar TK180 finesse worm hook. I thread the lure on the J hook the same way I would on a jig, with the hook point coming out the back of the bait. If snags are a problem and you want to rig weedless then I suggest a standard 2/0 R-bend worm hook like the Daiichi D39Z. 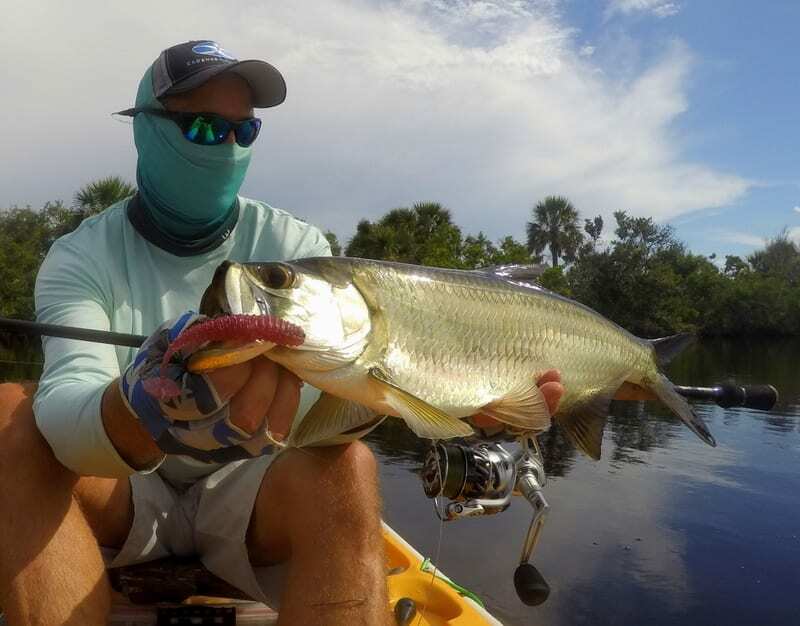 Of course jerk baits and swimbaits aren’t the only lures that will catch juvenile tarpon. Small jigs and plugs work. For plugs I’d opt for those with single hooks (or replace the trebles with singles) because little treble hooks do a poor job of hooking and holding tarpon. Casting these small lures can be a challenge if you are not using the right tackle. Most backwater tarpon are under ten pounds and are perfect targets for light tackle. Last year I had a blast catching tarpon on ultralight spinning tackle spooled with six pound test Platypus P8 Braid. To the end of the line I attached a couple feet of twenty pound test Platypus Stealth fluorocarbon leader. With this setup I can get all the casting distance I need with small lures plus have enough backbone to handle most of the tarpon I encounter. If there were tarpon over ten pounds I’d up the line to ten pound test and the leader to thirty. Juvenile Tarpon are also an ideal target on fly tackle. A seven weight fly rod with a floating weight forward line like Cortland’s Liquid Crystal Flats Taper is a good starting point. 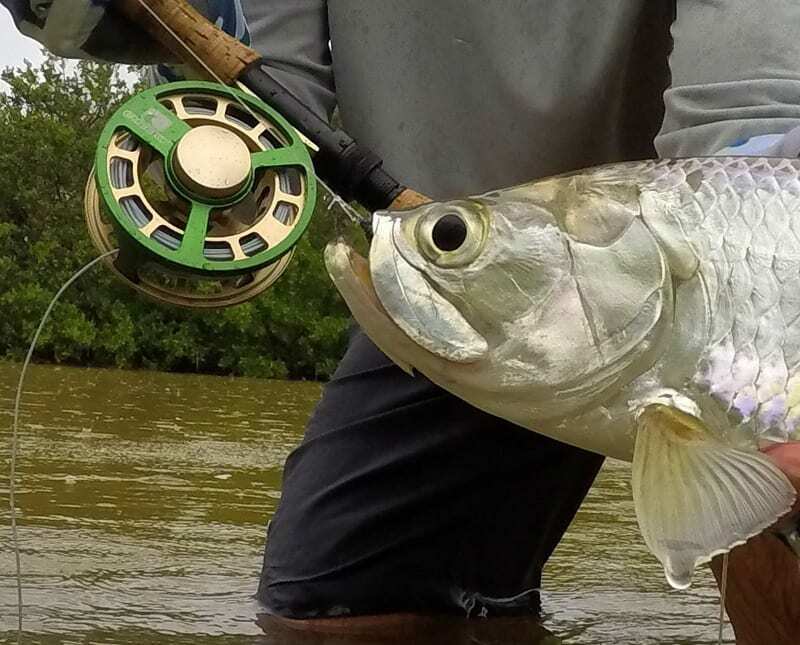 You don’t need a lot of backing or an expensive reel because these tarpon are normally caught in confined locations so long runs are not expected. Small, minnow imitating flies in the two to three inch range, such as Clousers, Seaducers, Deceivers and Muddler style streamer, are what you need for juvenile tarpon. The best tarpon fishermen are the ones who can make quick, accurate casts. If there are a lot of tarpon around I’ll blind cast, but most of the time I like to wait until I see a fish roll or strike bait and then fire a quick cast in its direction. Tarpon release bubbles after they roll so watching for bubbles can tip you off on which way the fish are moving. My last bit of advice is tarpon in Florida are strictly a catch and release fishery. Florida regulations also state any tarpon over 40 inches long must remain in the water. For more information visit (http://myfwc.com/fishing/saltwater/recreational/tarpon/).